Ellen Moody’s Trollope on the Net is a true pioneer work on the ways the Internet has changed how we read and talk about books, using Anthony Trollope as her subject. While anyone who loves Trollope’s novels will enjoy this book for its extensive commentary on his novels, Moody’s focus is also on how book discussions are held and how they inform our reading. Moody discusses the establishment of the Trollope and His Contemporaries list-serv discussion group in the late 1990s and how the group came to read together and discuss Trollope’s novels. She describes in detail the demographics of the readers involved in the list, the housekeeping of how participants voted and decided on which books to read, and the discussions of the books, along with what disagreements ensued, when participation was slow or active and why, and what was to be gained in terms of better understanding Trollope through reading as an online group. Moody is a longtime professor of English, and while she could have written a very academic book about Trollope, and there is plenty of thoughtful discussion here, she gives equal weight and interpretation not only to the professors and graduate students who participated, but to a wide variety of people, many of whom simply love Trollope and wanted to read his novels together. Setting aside academic theories that often interest no one outside of academia, Moody explores why people read and what has made Trollope, often ignored in academia, a favorite author among so many readers who have discovered him by chance or word-of-mouth and become devoted to his novels. Individual chapters focus on various works by Trollope that were read over a two-year period, including Trollope’s Irish novels, Can You Forgive Her?, Lady Anna, The Claverings, and He Knew He Was Right, and Trollope’s autobiography. Two especially thoughtful and powerful chapters are included, one on the Victorian illustrations created for Trollope’s novels and how they informed a reading of the text, and the other on why Trollope’s shorter novels deserve reassessment so they can be seen as equally of value as his longer ones. I will admit up-front that I am a bit prejudiced in this book’s favor because I joined the Trollope list-serv in late 1998 just after the period of group reads that Moody discusses in the book. At the end of Trollope on the Net, Moody mentions that the group plans next to read the Barchester novels, which is when I joined in. These group reads were my first real introduction to Trollope. Since then I have read over a dozen Trollope novels with the group, as well as works by Sir Walter Scott, Margaret Oliphant, George Moore, George Eliot, Elizabeth Gaskell, John Galsworthy, Ann Radcliffe, Victor Hugo, and Charles Dickens. For me, participating in the list has led to friendships and an enhanced understanding of Trollope and nineteenth century literature. It has been exciting to me to read Moody’s book and learn more about our group’s infancy. What I most admire about Trollope on the Net is the even-handedness and courage Moody provides in her discussion. For numerous reasons—all of them insufficient—Trollope has been ignored or looked down upon as a writer. I find this amazing since as a novelist myself, I have come to consider him one of my favorite authors and one of my greatest influences. As Moody reveals, giving examples from literary critics reaching back to just after Trollope’s death, most of the lack of appreciation and loss of favor for Trollope seems to stem from how he describes his writing process in An Autobiography. Rather than let people think there was some mystique to how an author creates, Trollope, as Moody states, “refused to participate in any cult of the artist.” Trollope reveals in An Autobiography how he would force himself to write in the morning before he allowed himself out of bed and how he set length requirements for himself each day. This mechanical and perhaps not glamorous view of writing badly hurt his reputation, but quite undeservingly, since as a novelist myself, I know what hard work it is to create a book and the dedication required; if you wait for inspiration to strike, you will hardly ever write a word. Despite his hard work, Trollope clearly was a man whose imaginative world was the most important aspect of his life, a man who dedicated himself to his work and consequently was able to produce a greater number of novels than any of his contemporaries who are held perhaps in higher esteem, but who also perhaps did not have any greater degree of talent, and many of them, notably George Eliot, acknowledged their debts to Trollope in their own creations. While An Autobiography may have hurt Trollope’s reputation, it is in some ways his greatest work because it is one of the first documentations of how a writer creates fiction. As Moody states, “His imaginative life was the one that counted most strongly for Trollope, the one which produced the books for which we value him. He left us a book in which he tried to explain how this part of his life grew and what it felt like. It was a generous gift.” Generous indeed. It is a light shining in the darkness for anyone, myself included, who has aspired to writing fiction. Moody provides plenty of discussion of the prejudices and misunderstandings of Trollope’s work, giving the reasons and arguments, followed by rational and thoughtful rebuking of these viewpoints. Her enthusiasm for Trollope is never out of place and while she is honest about Trollope’s weaknesses, she also makes convincing arguments for why he deserves the popularity he retains among readers. Overall, Moody has written a fascinating book about not only why Trollope deserves to be read, but why people read and how the Internet has changed how we read. 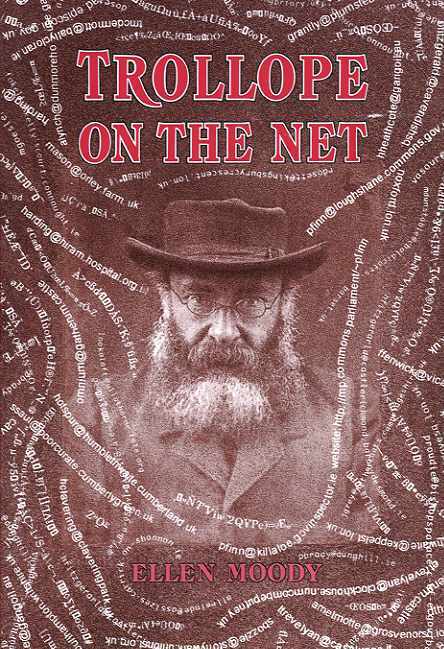 Beyond being a highlight in Trollope studies, Trollope on the Net is a book that should be read by anyone documenting how the Internet has changed how people communicate with one another.